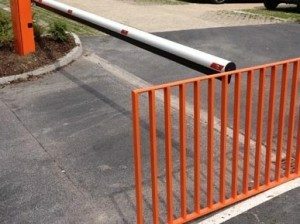 Barriers are an effective visual deterrent, requiring oncoming traffic to come to a complete stop, so immediately the level of security against vehicle access is increased. They can be automatic or manual barrier either standard or heavy duty. The top picture is an example of a rapid car park barrier where traffic safety concerns were caused by queuing outside of the barrier. This opens in 1 second and closes in just 1.2 seconds, resolving the traffic problem. The bottom picture features a standard duty 4 metre barrier with a safety edge fitted under the arm. Color-matched steel railings are installed to separate pedestrians on foot path from moving barrier.